Self help and DIY are kissing cousins. Does this smack of saucy consequences? Hifi has few of those. On what's mostly a keen divide, we have the solder slingers on one side who read schematics, work skil saws, get their hands grimy and occasionally blow things up or run high voltages through their bodies. On the more fearful side of tell me how—and if this were a bookshop—we have shelves that are mostly empty. There are no how-to audio books. There are very few videos which would teach our hifi secrets on Thai cooking, prenatal breathing exercises or how to raise an Akita. Hifi enjoys fewer practical support structures than most other hobbies, no real weekend seminars or applicable certification courses. Hobbyists hoping to pursue prosumer hands-on insights, facts and results are mostly left to their own devices. 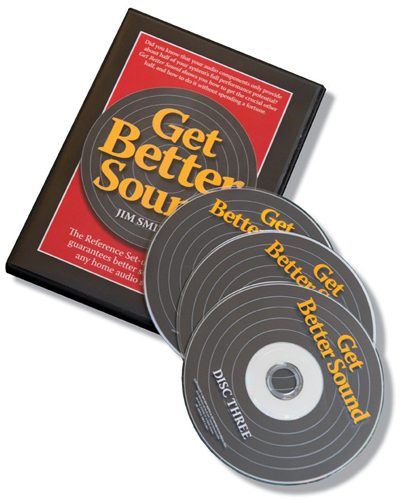 The three DVDs of Get Better Sound—an adjunct to the book of the same name which itself was an outgrowth of the author's 31 Secrets to better sound from his US importer days for Avantgarde Acoustics, Zanden and Audiopax—want to fill some of these gaps. The key question for owners of the book is, how well do the videos illustrate rather than merely talk about what the book already covered? After all, those who can read (cough) may not need to have the same materials 'read out loud' by an occasionally teleprompted presenter. Therein lies the rub. The advice of self-help gurus obviously is only as good as their experience and communication skill. With decades in the trenches spanning stints as sales manager for Audio Research and Magnepan, as hifi shop owner, as importer, as system setup expert, as industry consultant and amateur recordist, Smith has experience. Where most seasoned reviewers are limited to knowing how things work in their rooms, years in retail required that Jim install and optimize systems in customer homes to perform as good or better than his shop demos. Later he was responsible for trade show exhibits of brands he represented. Bad demos meant no dealer interest. 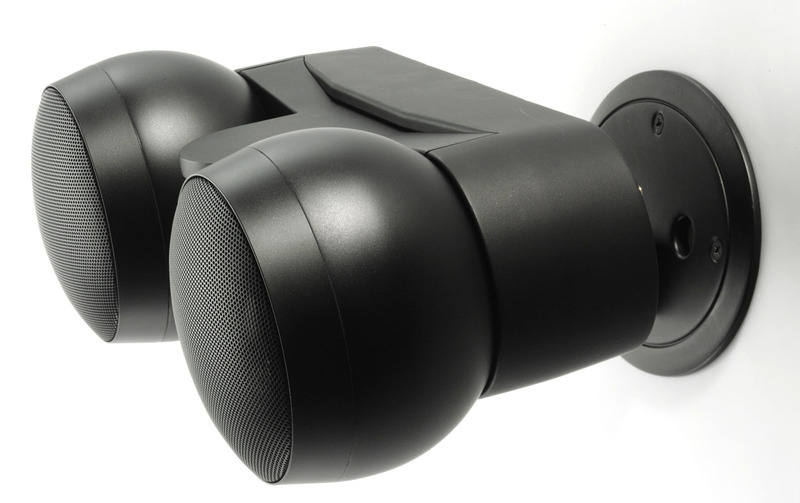 Jim's import business success hinged on making excellent sound under compromised conditions with very little setup time. After retiring from retail, he became an on-call setup man who'd fly out to customer homes to voice their existing systems for better in-room performance. To date the man has voiced many hundreds of systems. The book and videos condense his system voicing experience into the most important and useful tips from that career. I found the first 2-hour DVD frustrating for being too generalized whilst talking about rather than showing various subject matters. Jim essentially sits on a desk chatting anecdotally about things the book already covered better to occasionally rely on a black (actually white) board. Rather than being neatly prepared sketches however, he draws freehand and poorly. This takes little advantage of the video format. In these days of PowerPoint presentations and screen sharing it also feels unprofessional and sloppy. On the second DVD Jim for a few chapters finally moves us into an actual system he's previously installed. Here things could have gotten cracking to be a lot more practical and visual had he not been so inexplicably reluctant to touch the installation. The viewer is presented with fait accomplî. We do not observe the setup process in action beginning to end. We're not walked but talked through it. Perhaps because I expected more, this struck me as another wasted opportunity to exploit the concept's full promise—show us!—by sticking to the delivery style of a very informal talk-show host shot mostly against a blank wall. 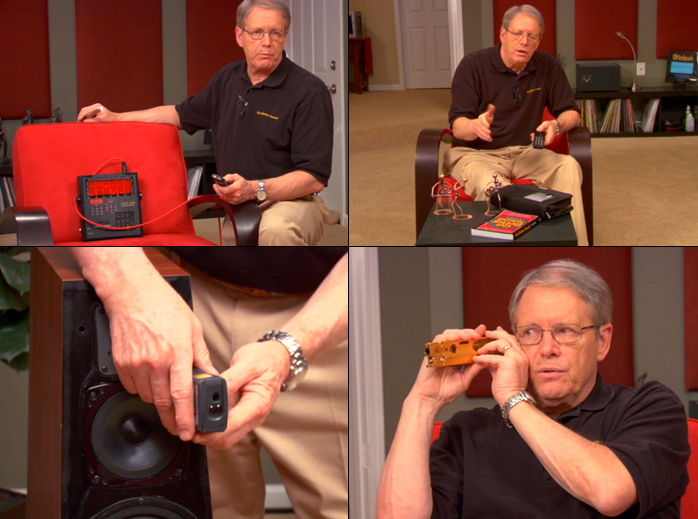 The voicing techniques Jim advocates naturally rely on listening to specific music whilst moving speakers and listening seat along a predetermined grid to find the precise locations where everything locks. It would have been useful to watch and hear him run a particular music track, identify for us what exactly he listens for when it happens, what he wants to presently improve in the system, then demonstrate progress over a few steps of hardware adjustments in an actual troubled room/system. Instead Jim covers that aspect by standing next to his black board writing out particular track sections of a CD he favors for voicing. He tells us what to listen for and what those sections might sound like if specific things with a system are wrong. Sadly neither do we hear the tracks nor do we see how whatever they reveal is applied to a particular system's performance. Too much theory, too little hands-on practice. Then there are instances of peculiar laxness. Showing us a personal setup tool by a maker "probably no longer in business", Jim omits to identify a current equivalent by name and source. Instead he says "google it". Does that strike you as too nonchalant? While talking AC polarity he admits to being clueless about how things work outside the US. Should Asian or European buyers of his DVDs feel good about that? As with the few black board interludes, more preparation and care could have taken the concept further. As I was sent one set of 3 DVDs to comment upon critically, I must confess to being very disappointed. Unlike Michael Fremer's definitive, hands-on and practical 21st Century Vinyl set, Get Better Sound's isn't as much show 'n' tell as it is talk with very little show. This undermines the chosen delivery format's potential. 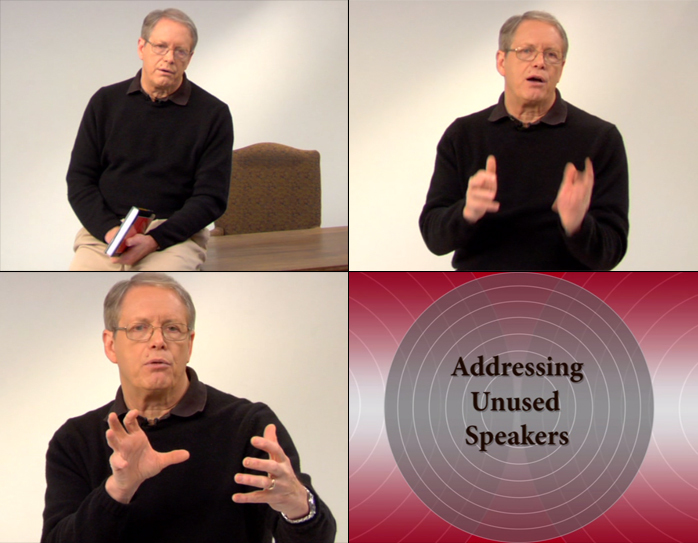 That's particularly relevant since these videos are also supplemental to the book. That already did all the telling at far greater lengths than the DVDs could. As a prior reader of the book I thus felt more teased than satisfied. After 5+ hours of viewing, I was left badly wanting. All along I expected a culminating chapter that would show what preceded it to now hands-on apply it all from the beginning to the end of an actual but obviously time-lapsed installation session and illustrate the core concepts by visual example. To get that one apparently has to part with longer green and hire Jim Smith to actually come out to the house. In the end I found his purported self-help concept too focused on self promotion, not enough on viewer help. If one chanced upon first the DVDs and not the book, reactions could well be different. Altogether best would have been to bundle book and DVDs such that the latter tracked the book chapter by chapter but rather than repeat things verbally condensed, put the book's words into visual action. Either that wasn't Jim's vision to begin with; or if it was, it didn't manifest accordingly. Too bad. He clearly has worthwhile experience to share. He's also a skilled author. The videos simply needed a different producer to cash in on the inherent promise and deliver rather than talk about it. As I was thinking about my reply, I realized that Srajan has been commenting on my various efforts, including the Get Better Sound book, for almost a decade. His comments have been favorable. Not so much this time.In this case, I think it’s a matter of perception. When I decided to do the DVD, it was produced partly out of a growing frustration that audiophiles may have read the book, but they still missed some of the importance of various tips. I discovered this on voicing sites, in hundreds of phone calls, and countless e-mails. However, I didn't visualize the 3-disc DVD set to be a necessary adjunct to the book. 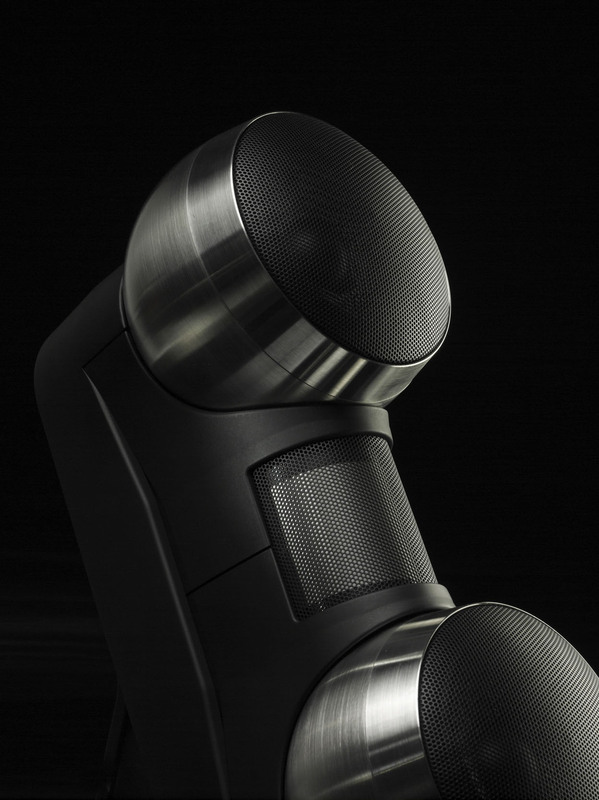 It was primarily new Get Better Sound clients that I wanted to reach who could “get it” more easily through a visual medium, at a lesser price. And that’s proven out, as over half of the DVD purchasers appear to have never owned the book. 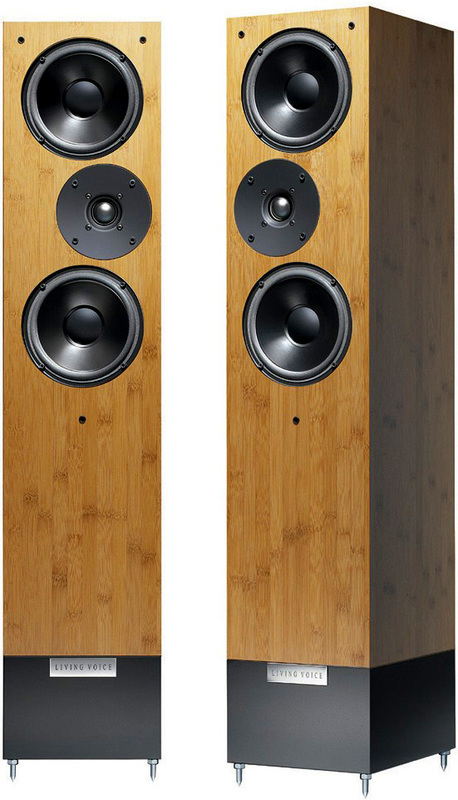 (1) audiophiles are more visually oriented than I originally thought when I wrote GBS. (2) they’ve been urging their friends to buy it. 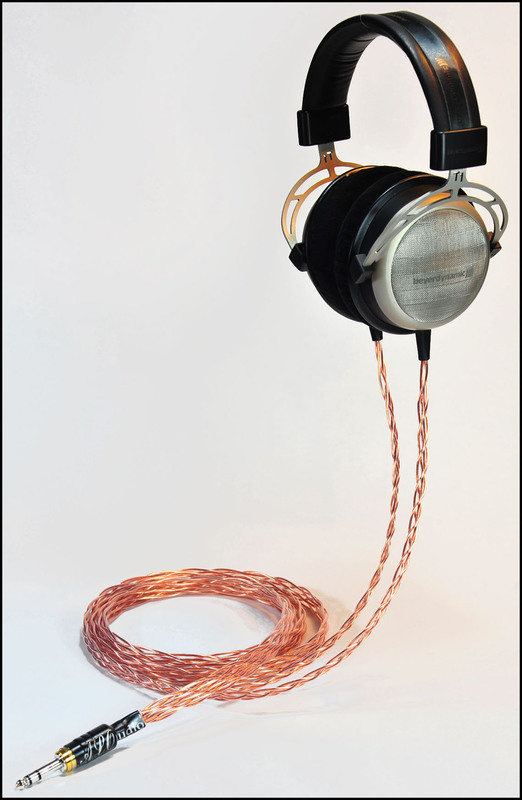 (3) at just $19.95, the price is far below any audio component out there, and if even a few of the 110+ tips are followed, they can contribute a real improvement in sound. Srajan didn’t mention the Quarter Notes Newsletters. We’ve had a huge response to them. Included with the $19.95 purchase, the first eight issues are already equivalent in size to a small book (but they do have to be read). Srajan actually wrote a guest article in one issue. One point that Srajan mentioned was of special interest to me. I wanted to record the differences that certain adjustments made. But—in my opinion—it was hopeless. The full impact of the changes were diluted with less-than-stellar video sound. We needed serious microphones, serious mic preamps, and a perfectionist recording set-up at a minimum. So I gave up on the idea, even though it was initially appealing. Honestly speaking, I might not have sent the DVD set to Srajan if I knew how he would react. No one wants a review that isn't glowing with praise on nearly every line. Since he’s been on the high-value track for quite a while, I thought that—at just $19.95—he’d see it as the very essence of that concept. The GBS book is nearly 300 pages in length. The 3-disc DVD set is 5.5 hours. When you factor in the new info, it is more condensed when the book is the direct comparison. There was no way around it, unless we produced many more discs at a consequently higher price. However, when compared to what else is out there to help audiophiles get better sound, I like to think that’s a very different story. Finally, the DVDs have received other reviews and hundreds of wonderful customer comments (many from book owners) that have quite the opposite viewpoint. In fairness to all, I plan to put a link to this review on the GBS website, along with the others. Thanks to Srajan for always calling it as he sees it.